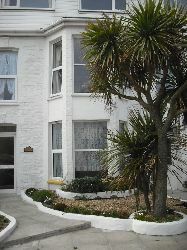 Sunset holiday apartment in the heart of the surfing capital of England, Newquay, Cornwall!! A stone's throw from the main surfer's paradise of Fistral Beach. 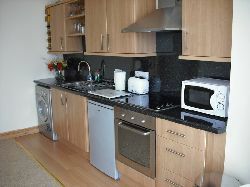 A modern, spacious 1st floor apartment, offering everything you would require for an enjoyable holiday. The apartment consists of a spacious lounge with a large bay window, letting in plenty of sun! A modern galley-style, spotlit kitchen takes up 1 wall. 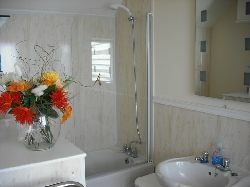 Separate double bedroom, with large en-suite bathroom complete with full-size bath and a powerful shower; and heated towel rail. The apartment can easily sleep 4 with 2 sharing the double bedroom, and 2 using 1 of the 2 double futons in the lounge area. 1 secure parking space is available to the rear of the apartment. 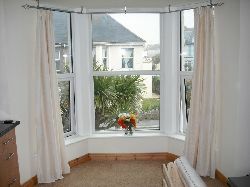 Perfectly situated for all Newquay's amenities! !